Black Iris Hotel is located in Madaba – the famous Mosaic City – 30 kilometers southwest of Amman and 20 kilometers from Queen Alia International Airport. If you plan to rent a car, there are signs on the road to show you how to reach Madaba. If you prefer to catch a bus, Madaba Bus station is a 10 minute walk distance from the hotel. 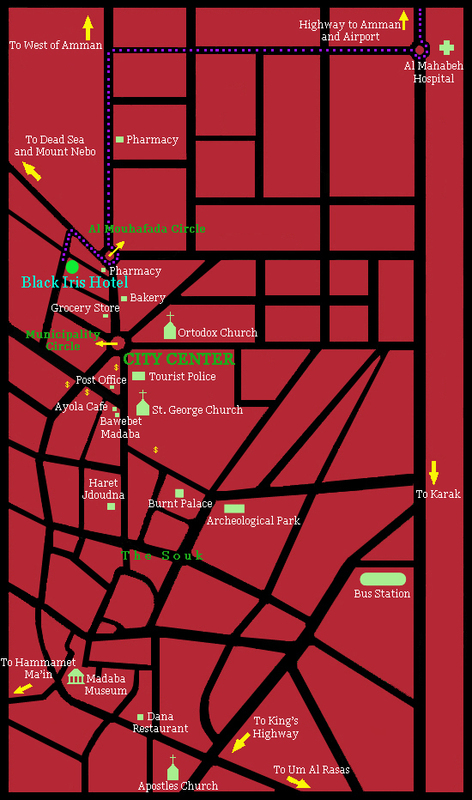 Black Iris Hotel is just 200 meters from Mouhafada Circle (the main square) and a 5 minute walk from St. Georges Church, where the Holy Mosaic is located. Black Iris’ location offers guests the unique chance to be in the heart of the city as well as in a peaceful and silent neighborhood. Petra is located three hours by car through the King’s Highway, while Aqaba lies four hours through the Desert Highway.